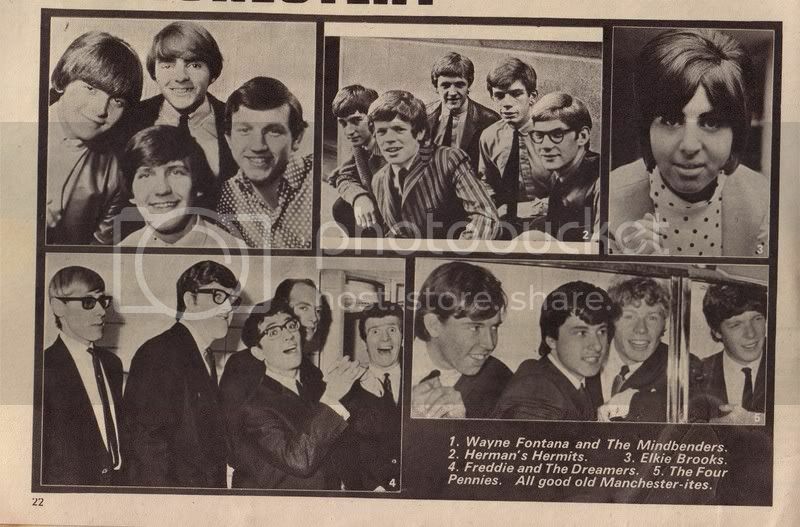 This is from the British pop music magazine Fabulous. 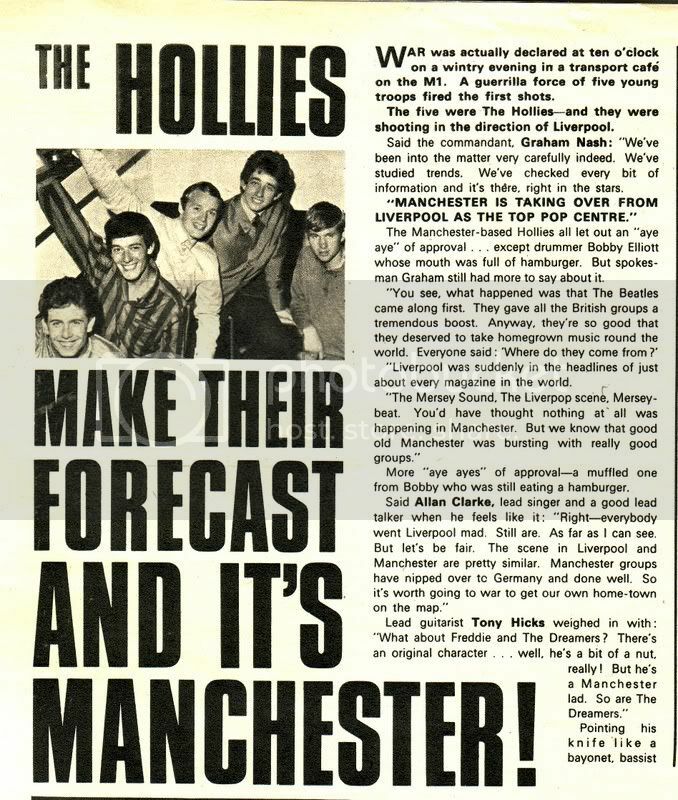 This issue is from December 5, 1964, and the article's full title is "The Hollies Make Their Forecast and it's Manchester." The boys talk about their battle strategy for ousting Liverpool as the pop capitol of Britain to make way for Manchester. It's cute, funny, and is a delightful step back in time to when rock stars did not take themselves seriously. I had to scan the article in pieces so it could all fit here, since Fabulous is larger than a standard-sized magazine! Wow Vrinda what a terrific article! I suppose it was somewhat of a turf battle in those days with all the fledgling beat groups vying for chart supremacy. Really a great post. Hope you can dig up a few more along the way. Classic article. I love it. I have one question for you British folks who actually were there in the 1960s - when did "gear" fall out of fashion as slang? I think that the Beatles say that work in the Hard Day's Night movie, right? You're welcome, guys! I'll see what else I can find. Yes, Sparky, the Beatles do use "gear" in A Hard Day's Night. That's where I first heard it, but I don't know when it stopped being used as slang. It was before my time, so I don't know much about it. The others here can tell you more. Great read, many thanks. It's great to read things from back in the early 60's. I think it's George Harrison that says Gear in the Beatles movie when he was asked about these so called trendy clothes. You're welcome, Snowflake and Anthony! I also like to read these articles from the early sixties because it makes you feel like you're there when it's happening, and makes those of us who weren't wish we were! Yes, SF, it does seem ironic that they waged war on Liverpool when five years later, they would recruit one of "the enemy" ! Perhaps Terry got a special dispensation because the band first worked with him in neutral territory - Munich, Germany, in '65 - when Allan and Graham subbed at the show when other members of the The Escorts fell ill. And, despite all the trips English bands had made to play German gigs or tours by that point, several Mancunians probably felt very comfortable around a Liverpudlian. I used to read Fabulous (208), but not as early as in 1964. I thought the Hollies were a thing of the past for me, but at Dalhalla, they sure proved me wrong. It was my pleasure, Agneta! When did you start reading Fabulous? I'm not exactly sure, but somewhere around 1969 or 1970, and then I bought it more or less regularly for some years. Actually, I thought I had saved some of the magazines but I've only found one, from October 1970, whith nothing about the Hollies in it. New Musical Express I used to buy weekly for that period too, and sometimes Melody Maker and Rave, a monthly magazine. I improved my English a lot, listening to pop music and reading about the Hollies! If it improves lingusitic abilities and creates better understanding across cultures, along with introducing you to the Hollies, than reading those music magazines was well worth it! Great article(slap my wrist for not reading it sooner ).Manchester and Liverpool both rock as far as I'm concerned.The amount of talent to come out of those two cities is absolutely astounding .I think the competition between the two cities was a very positive thing.In my opinion Northern Talent is still strong.It's the cold weather you see.We have to either,dance,sing or laugh to keep warm .